This brass instrument has sides with a length of 135 mm and 136 mm respectively with two sights fixed to one side. A hole indicates the place were the missing plumb bob was fixed. On the back are two volvelles, each with an index. 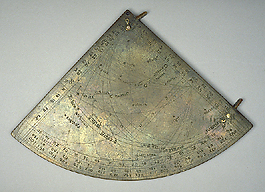 Front: On the outer edge of the right-hand side are engraved two linear scales which serve to determine the sine and cosine of an angle. One runs from 0 to 60, numbered by 5, the other in the same direction from 60 to 120, numbered by 10, and from 10 to 60 in the opposite direction, numbered by 10. On the left hand side are two scales for declination and for latitude which serve for the determination of the distance of a star from the equator or the north pole respectively. The declination scale starts in the centre from 0? to 90?, numbered by 10 and divided to 2, and again from the centre from 0? to 231/2?, numbered by 5 and divided to single degrees. The latitude scale runs from the outside to the centre 0? to 90?, numbered by 10 and divided to 2. On the circular border is a double scale engraved with four scales, which together account for the full 360? of the astrolabe, numbered by 10, divided to single degrees and marked as follows: 10 to 90 from left to right and 100 to 180 from right to left, 190 to 270 from left to right and 280 to 360 from right to left. Further to the inside is a scale (3 times 0? to 30? from left to right and 3 times 0? to 30? from right to left) for the signs of the zodiac, numbered by 10 and divided to single degrees. In a similar manner to a Profatius quadrant the ecliptic appears as two arcs divided into the 12 signs and marked with the usual Latin names of the zodiac. Several horizon lines are marked but the latitudes are not further identified. The unequal hour lines are marked, but not numbered. A shadow square to the base 12 is superimposed, numbered by 3 and divided to 1. The position of 12 stars are indicated and their names given as follows: 'Alchimek, Aldira, Algorab, Allabor, Allawe, cor scorpius, coruus, menkar, myrak, rigil, ursa, Wega'. 1) A zodiacal scale marked with the usual names of the zodiac. Each sign is numbered 0? to 30?, numbered by 10 and divided to 2. 2) A Julian calendar scale marked with the usual Latin names of the months, divided to the corresponding number of days and numbered by 10 and divided to single degrees. The first point of Aries corresponds approximately to 12 March, but the divisions are not clearly marked. 3) A scale numbered 1 to 28, indicating the solar cycle. The outer volvelle is marked 'Sol<is> dict<us>' [?] and has a scale 1 to 29. The inner volvelle is marked 'luna'; the scales are drawn, but have no markings. The instrument was purchased from Christie's in 1995. For other related astrolabe quadrants see E. Dekker, "An Unrecorded Medieval Astrolabe Quadrant from c. 1300", Annals of Science, 52 (1995), pp. 1-47, where this quadrant is named 'PCII'.